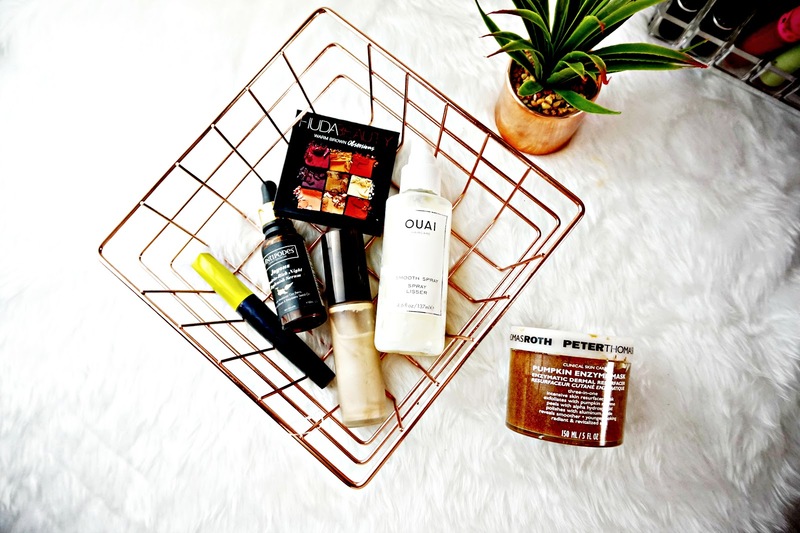 The latter half of November was super exciting because I went to New York and most of what I took with me were beauty products I knew I could rely on so there's quite a few old favourites that made their way into this months Best in Beauty. This used to be my holy grail primer, I'd always go back to it. But the past few months I've been testing so many new ones this has somehow got forgotten about. I've fallen back in love with it though. This primer is a glow enhancing liquid that does just that! It gives my skin a gorgeous, lit from within glow that isn't over the top or glittery. It makes my skin really smooth and all my favourite foundations apply beautifully over the top. Huda recently launched a few little palettes containing 9 eyeshadows, I obviously went for the warm one. Which, as the name suggests, is very warm toned! The formula of these shadows is incredible. All are buttery soft, well pigmented and so easy to blend! They stay all day on the lids without fading or creasing. I loved this so much I actually brought the Desert Dust palette, which I'm loving just as much. Regular readers will know how much I love Ouai as a brand so I was super excited to try this and I love it! It's kind of like a leave in conditioner that tames frizz and adds shine without being heavy on the hair. It makes my hair so much more manageable and easy to brush. I like to use it on wet and dry hair, it really helps condition the hair and leaves it so soft. I'm actually almost out of this but I will be repurchasing soon! This mascara adds amazing length to the lashes. It has a super small thin brush that grabs and coats every lash, even the tiny ones. The formula is very Black and it lasts all day without flaking or smudging. In the middle of November my skin went crazy, I'm not really sure what happened but it was covered in tiny bumps and was so dry. And this Protein rich oil really helped sort it out. It has oil which I tend to prefer to use at night but because my skin was so dry I'd been using it in the day to. It really helped keep my skin hydrate and helped my makeup apply better over the dry areas. As I said my skin was covered in tiny bumps so I'd been using this in an attempt to scrub them off and it really worked. This is an exfoliating mask that uses AHA to lift away dead skin cells. This is one of the strongest AHA masks I've tried, I can't actually leave it on for longer than 3 minutes because it really burns. It's probably not a good thing but the results are fantastic! My skin looks and feels a lot smoother. It actually looks plumper too, I think that's because all the blood has rushed to my face from the burning sensation. Plus the pot is huge, I can't see myself running out of this anytime soon. So that's everything I've been loving throughout November.